I have been thinking of things, or events, or people, to blog about. But I can't think of anything. Hahaha. Gosh pressure! 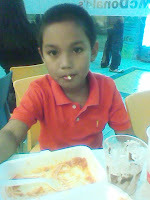 I'm actually busy thinking of Algene's b-day (next week na! double pressure!). Well, I know she won't be reading this, aside from the fact that they have no internet connection right now. Bleh. Hehe. 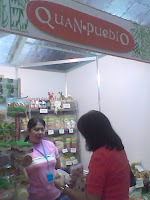 Last Sunday I went to Rockwell with my mom to check out the Negros Trade Fair. 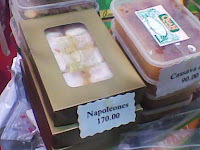 We ended up buying my mom's favorite: Dulce Gatas from Tita Agnes' (she's actually my lola) store QUAN.PUEBLO. I swear they sell the yummiest (if there's such a word) delicacies. 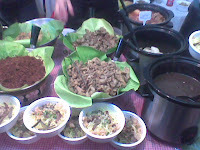 Here's my Tita-Lola's stall (they have a branch in Dian St. in Makati go check them out!) Lots and lots of comfort foods! * Everyone's all-time fave Pitaw (chicken cooked adobo-style and shredded). My lolo used to make us homemade pitaws. I miss it. I miss him. :) This 1 container is P200. * my mom's fave Dulce-Gatas. I swear it tastes heavenly. 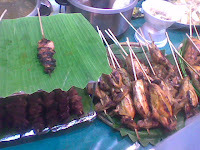 Back in the days, when we used to spend our summer vacation in Negros (Bacolod & La Carlota) my lola always make this. I miss those days. :) My mom's diabetic but I can't make her stop eating this. 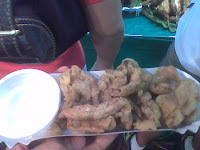 I ended up buying my all-time favorite "chicken skin" for P80. In fairness, mahal sha for P80 ha pero since this is not the typical "chicken skin" that's full of flour that you see on the streets, pwede na rin. Hehe. I should have passed eating at KFC before going there, eh d sana I ate nalang the all-original chicken inasal (not like the ones you buy in malls). Hmp. 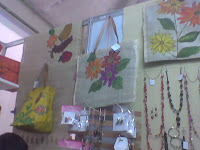 We also visited my grandma's friend Ditas Jalandoni's accessories stall. My mom insisted that I buy something from them, haha. Their pieces are nice but it's not the usual accs I patronize. So I passed. This is the best stolen shot I got. I was bored to death. I would have bought their native bag (that's soo cute, I'd post the pics soon) if it weren't sooo expensive, it's P750 kaya! No way. Haha. So we just asked for their calling card. As if naman, we'd call them. Hehe. So after that, we went to my Lola's house in Q.C. AGAIN, as a part of me reconnecting with friends. I missed them! :) We didn't drink though (finishing 1 glass of red horse cannot be considered as drinking) so we decided to go to Starbucks. Oh and before that, earlier that night I went to SM with our cutesy ampon JD. My grandpa showed us his report card and in fairness his tutor did well ha. So as a gift I bought him 2 pairs of shoes. And like I said before he's not the type who points and points at things he would like us to buy. But as we scoured the racks for any shoes he'd like (you should be good at guessing and feeling if he really likes them coz he's so bait he's like the ambassador of yes-es), eventually I got his technique, his way of telling me if he likes the shoes or not. If he says, "masakit sa paa" or "maluwag", even if it's soo obvious it fits perfectly, then it means I should just give it back to the saleslady. Haha. So after 2 hours, I finally heard the words "Masarap sa paa". Haha! I felt happy and relieved. :P Anyway, after that we ate at Mcdo (told you mababaw lang kaligayahan nia). * JD with fries in his mouth. Pacute lang. In fairness, it was kinda fun bonding with him. People were looking and if I could read their minds I swear they're saying "Bata naman nito nagkaanak" or "he was definitely born out of wedlock". Haha! Role playing is fuuun. Oh baket at least I'm a hot mama noh! And in fairness, the salesladies and gentlemen are extra nice ha. I wonder why. Haha. So there. What a fun fun weekend.